A good daily skin care regimen is vital to keeping your skin looking healthy and youthful, but a daily skin care routine can be… well, routine. Chemical peels are an excellent way to invigorate your daily skincare routine because they jump-start exfoliation of the outer layers of skin revealing the fresh, new, undamaged skin below. 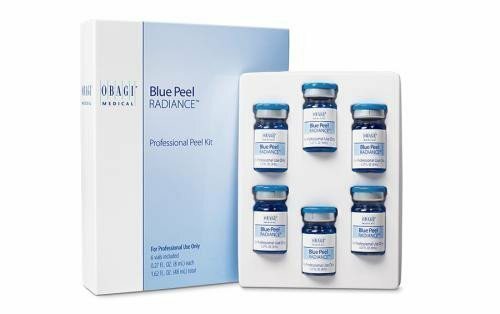 Obagi Blue Peel RADIANCE is a gentle, yet effective, way to get visible improvement in skin tone and texture, even for people with acne prone skin. If you struggle with acne prone skin, you may have thought that a chemical peel was out of the question, but that is not the case. Obagi Blue Peel RADIANCE is a salicylic acid-based superficial peel, meaning it only penetrates the outermost layer of skin, known as the epidermis. Our highly knowledgeable and experienced aestheticians can help determine the best application to optimize your results, so even those with sensitive skin can benefit from Blue Peel Radiance without irritation, pain, or downtime. Obagi Blue Peel RADIANCE is a quick treatment applied in office by an aesthetician that specializes in peels. Many patients start seeing visible improvement in the appearance of uneven tone and texture, fine lines and wrinkles, and acne and acne scarring after just one peel. Although a series of four to six treatments is usually recommended to achieve maximum improvement, one of our aestheticians will evaluate your skin and determine what is best for you to achieve your desired results. If you would like to improve your overall complexion, call our Skin Klinic (480) 451-1700 and find out how easy it is for Obagi Blue Peel RADIANCE to help you see firmer, smoother, brighter-looking skin!